The French word for a furniture craftsman is "ébéniste" from the early but short-lived practice of using ebony wood for veneers. Despite the switch to other woods, the label stuck. "An inclining table for the use of writers or readers, made commonly with a box or repository underneath it," Samuel Johnson, defining a desk in the Dictionary of the English Language, 1755. As a piece of furniture, the desk has had a short history. This did not affect its eventual establishment as an essential piece in a gentleman's home, but it was, perhaps more than any other furniture, a creation that was dependent on advanced civilization. For a long time, a bed, a table, a chest and maybe a chair were the rudiments of furniture for everyone. Even the nobility of the Middle Ages did not possess much more though they had them in greater number. It took a combination of events that led to a dramatic rise in the European standard of living to create the right climate for the most learned of furniture: the desk. A Sarcophagus Commode decorated with ormolu mounts representing Masks of Bacchus from the Monaco collection of Hubert de Givenchy. Before 1450, the masses were illiterate--in a big way--because there was no benefit to being otherwise. Life for most people was lived out on a feudal farm, or for a smaller number, perhaps in a city or town as a member of a guild. Knowledge of the latter profession was taught by an elder member, meaning that even these craftsmen had no need for reading skills. Reading ability (and writing skills) were the clear province of clerics, holed up in monasteries for their entire short lives, hunched over a table that may have resembled a rudimentary desk, copying laboriously the books in their possession. It was about 1450 when the future of mankind took a different course with the invention of the printing press by Gutenberg. Only 50 years later, there were 20 million books in existence, Martin Luther was about to shake the foundations of the Roman Catholic church with his printed pamphlets on reformation, and the western world was on an irreversible path towards literacy. FDescribing the details and history of early desks is hard because few pieces have survived. The contents inventories of estates are of invaluable help when they can be located. For example, the 1645 inventory of Ham House near London lists no writing furniture, yet by 1679 two writing desks, called "scriptors," are listed. They are described as small, simple cabinets on stands, containing pigeonholes and drawers. Probably Dutch, they had veneers of kingwood and silver handles and mounts. Where no inventories can be found, historians rely on paintings and engravings or, even better, on pattern books published by furniture makers. Perhaps the most famous pattern book was the Gentleman and Cabinet Maker's Director, published by Thomas Chippendale in 1754 in England. By the 16th century, writing tables could be found in Italian palaces, reflecting the heart of the Renaissance movement. Early in the 17th century, small writing cabinets or boxes had travelled to Northern Europe, specifically the Low Countries of Holland and Belgium. They were portable affairs consisting usually of a slope-front table with a leather top and a lid hinged at the top that locked. These were especially useful for travellers. The next 100 years would see the evolution of many desk forms that would spread across Europe and the Atlantic. In Britain, the restoration of Charles II to the throne in 1660 ushered in a prosperous, tranquil period that was ideal for the growth of new ideas such as furniture styles. Growing affluence gave more people the means to purchase discretionary items; furniture was an important purchase since it has always been a status symbol. The quality of postal services had greatly improved by the end of the 17th century which further necessitated the development of the desk. Colonization and travel were taking people beyond the boundaries of their birthplace; staying in touch through the post was no longer just a novelty. When Samuel Johnson published his Dictionary of the English Language in 1755, he was acknowledging the growing level of literacy. The fact that he could define the word "desk" is evidence that it was a successful furniture form by this time. Reading and writing were already considered important skills by the upper classes. Two standard types of desk were descended from the portable writing box. The difference lay in the visibility of the writing surface. The first sort of desk was the slope-front bureau, also known as the fall-front desk in America. Its writing surface was hidden when not in use by lifting the bottom-hinged flap up towards the cabinet where it rested on an angle. When in the open, horizontal position, it was supported by chains or by sliding arms called lopers that were retractable. This desk was fairly standard by 1700. Another equally popular type had a flap that folded up as well but instead of being angled was vertical when closed. This was called the fall-front sécretaire. A third type was closer to the table in form because its writing surface was flat and could not be hidden away. This was most popular in France where it was called a bureau plat. Its design was ideally suited to a large room in which it could stand in the middle of the floor. 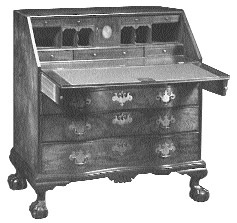 In Britain the pedestal desk was similar to the bureau plat. The pedestal desk had a large writing surface balanced on drawers with a space between the drawers to accommodate the knees. The pedestal desk became associated with libraries in Britain because of its suitability for the middle of a bookcase-lined room. The pedestal desk has descended relatively unchanged to the present as the office desk. The favourite desk in Britain by far was the slope-front bureau (or secretary) with drawers underneath and either enclosed drawers or a bookcase behind doors on top. This desk was adaptable; the top could even be removed without adversely affecting the design. Its versatility was much appreciated in the household. In America, too, this desk with bookcase above was favoured though it developed regional differences such as a bonnet top. The fall-front desk (mentioned above) had a slant top but no bookcase or cabinet on top. In smaller rooms, fold-down desks provided both space-saving design and privacy from overly inquisitive visitors. These desks frequently came equipped with locks which became more necessary as literacy increased. The French seem to have pioneered many desk designs which is evident from the multitude of desk terms that are French: bureau Mazarin, tables à écrire, bonheur du jour, secrétaire, secrétaire à abattant, secrétaire à capucin, secrétaire en armoire, secrétaire en dos d'âne, secrétaire en pente, secrétaire en tombeau, and probably others that I was unable to unearth. The bureau Mazarin, a kneehole desk on legs, was the likely predecessor of the British and American pedestal desk. (The French used the word "bureau" to refer to any type of writing furniture.) The Mazarin did double duty in French bedrooms as a dressing table for ladies. 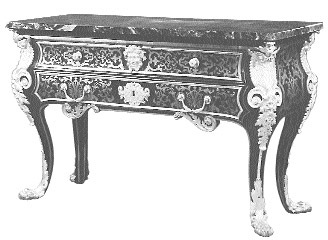 Though both the French and English created a slope-front ladies' desk in the early years of the 18th century, basically a scaled-down version of the standard slope-front, the French "tables à écrire" were generally more versatile. These would contain spaces for pen, ink and paper and an area for writing. Perhaps the most useful French ladies' desk was the "bonheur du jour," created about the middle of the 18th century. This piece featured raised drawers near the back edge of the writing surface for extra storage space. The area on top of the drawers was usable as well since it was enclosed on three sides by a low, ornamental railing. The secrétaire was the term used for a variety of 17th and 18th century desks that incorporated a fall front design, that is, a bottom-hinged front section that opens by falling forward. The previously mentioned English secretary referred only to a slant-top desk; the French term encompasses both slant-top desks--secrétaire en pente--and those that close to a vertical position--secrétaire à abattant (also known as a secrétaire en armoire for its resemblance to that piece of furniture and as a secrétaire en tombeau because it also looked like an upright sarcophagus when closed). The secrétaire en pente frequently had a bookcase on top, though this style of desk was not nearly so popular as it was in Britain. The secrétaire à capucin was a table that could be converted to a desk by ratcheting upwards some drawers and unfolding a leaf to be used as a writing surface. The secrétaire en dos d'âne was basically two slant-top desks that were joined at the back so that the two users faced each other. The renowned davenport desk, widely used in Victorian Britain, was a British development first made about 1790 by Gillow for a Captain Davenport. It was a small desk with a shallow slope atop a tall, narrow chest. Drawers were arranged down the side. The 19th century saw no significant new desk designs. The first several decades was the Empire era in France, the Regency in England and the Federal in America. The styles were very similar because they had all descended from the Empire style. Furniture was large in scale and severely classical. Veneers were fashionable, worked in dark, rich woods and ornamented by gilt mounts in France and brass in England. Desks were also constructed from papier-mâché, literally "chewed paper," a form of furniture construction that was developed during the mid-Victorian era and that was used especially in Britain. It was light, strong and cheap to produce, and so was a favourite of Victorian manufacturers who were striving to reach more and more middle-class consumers. Rudolph Ackerman, founder of the fashion periodical The Repository of Arts, Literature, Commerce, Manufactures, Fashions and Politics, declared in 1814 that "we now universally quit the overcharged magnificence of former ages, and seek purer models of simplicity and tasteful ornament in every article of daily call." How ironic that, by mid-century, the Revivalist excesses of the Victorian age could once again be fairly called "overcharged magnificence" by almost any observer. In the United States, William Wooton of Indianapolis designed and manufactured a desk in the late 19th century that was available in four grades of quality. The popular Patent Desk featured an incredibly elaborate design of double doors on castors that swung open to reveal a practical but dizzying array of pigeonholes, drawers, filing slots and compartments. There was even an outside letter slot through which messages could be dropped when the desk was closed. American Frank Lloyd Wright designed desks of sheet metal as early as 1904. This, of course, was a dramatic glimpse of decades to come. The cool, uncluttered modernism associated with the 20th century was also evident in the work of the Bauhaus, a German craft school operated between 1919 and 1933. At about the same time, Art Deco began its glamourous reign. Sleek, low-slung geometric designs with plenty of chrome and steel were its hallmarks. Desks in the home were no longer a practical necessity once office buildings began to be constructed. The desks of today resemble their 17th and 18th century predecessors very little, but the adaptability necessary with innovations such as the computer industry still requires the same ingenuity to produce a workable solution.